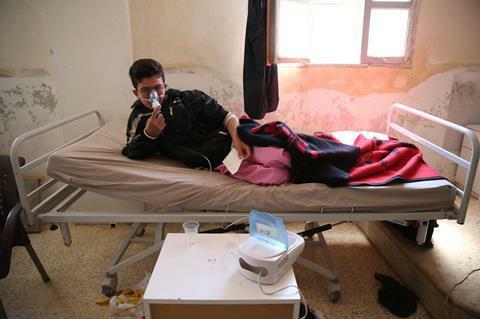 On the morning of 4 April, reports emerged of a suspected sarin gas attack in the Syrian town of Khan Sheikhoun. The attack immediately drew condemnation from around the world; footage and images of the dead and dying filled newspapers, websites and social media feeds. On the morning of 7 April, 59 cruise missiles arced out of the Mediterranean Sea and fell on the Syrian airfield suspected of having launched the attack. They were armed with high explosive warheads; weapons to destroy weapons. The retaliation was welcomed by governments around the world as a just response to chemical weapons use. Chemical space can be a very grey area. Chemical weapons are perhaps the most extreme example that knowledge can both help and harm; even as vile a specimen as sarin shares a coin with science’s compassionate contributions. Knowing how sarin stops our bodies recycling acetylcholine is the same knowledge used to make drugs that treat the symptoms of neurodegenerative diseases. Today, the only legitimate chemical weapon research concerns tracking, detecting and eliminating them, but science is still a vital component of national security and defence. Governments around the world also employ ‘dual use’ research programmes to capitalise on knowledge’s plasticity by supporting research that could have both civilian and military applications. But there are some notable exceptions. In Japan, opposition to war has been part of the national identity for decades. In the aftermath of the second world war, Japan enshrined pacifism in Article 9 of its new constitution. And its scientists undertook similar commitments – cooperating with military organisations was prohibited in the charters of its scientific bodies; the Science Council of Japan (SCJ) vowed ‘never to engage in scientific research to be used in war’. Yet, in recent years, the Japanese government has been pushing for changes to that article and it is now offering substantial funding for a dual-use research programme. The government says the move will give Japan a more prominent global role in peacekeeping and security, though opponents of the plan also point to the economic gains of exporting defence technology. The SCJ has called on scientists to boycott the programme, concerned that such research, however open or benign today, inevitably leads to uses that contravene its pacifist creed. Others feel that science and society are inseparable, and that researchers will follow the funding. Japan’s scientists face a quandary about how what they learn today might be used tomorrow. It’s an important moment. Yet it seems a moot point when we already have the capacity to do such harm. In that regard, the international accords that keep our destructive capability in check and, in some cases, work to diminish that capability are more vital. Scientists have a duty to prevent research being misused but ultimately citizens and governments are responsible for determining which applications are acceptable and which are not. In the graphic novel Watchmen, the character Ozymandius is a scientific genius who averts nuclear war and secures world peace by committing an atrocity so horrific it eclipses even nuclear and chemical weapons. National governments immediately end all hostilities in a show of solidarity. It might sound like science fiction, but if peace exists in the chastened silence that follows catastrophe then we don’t need Ozymandias; we can look on our own works and despair. Images of children lying in hospital beds, struggling to breathe are hard to view. And they should be harder to forget, to remind us that the knowledge we have can be put to terrible use.